The Rabbi with a Blog (Rabbi Jason Miller): Yes, of course... the annual Jerusalem Report Swimsuit Issue. Wh-aaaat?!?!? 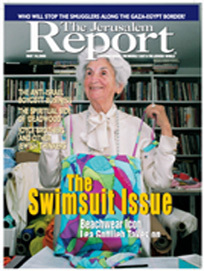 Yes, of course... the annual Jerusalem Report Swimsuit Issue. Wh-aaaat?!?!? I definitely did a double-take when I looked in my mailbox at work and quickly spotted the words "THE SWIMSUIT ISSUE" printed across the current week's issue of The Jerusalem Report. At first I thought it was a parody, but then realized it's just an article about a swimsuit designer.